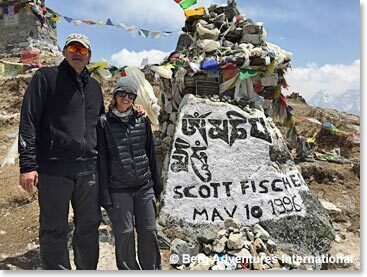 Earlier today Garv and Kylie stood at Scott Fischer's memorial, which they passed on the walk from Pheriche to Lobouche. It is less than two weeks until the 20th anniversary of Scott's death high on Mount Everest. A couple of hours later Ang Temba sent us a message that the group had arrived at Eco Lodge. They are now at 16,000 feet! We know that it is cold there, but the beds are cozy we expect that they are settled in warmly now dreaming of walking higher on the glacier tomorrow. 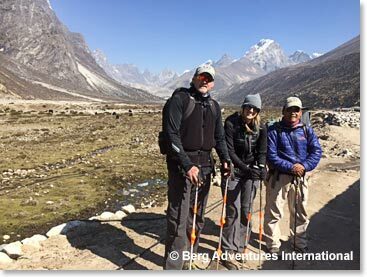 Mark and Kylie at Scott's memorial, which sits on the terminal moraine of the Khumbu Glacier above the village of Thukla. Leaving Pheriche with Min in the early morning. Another beautiful day! Taking a rest along the trail. 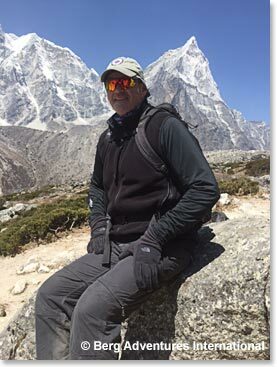 That is Ama Dablam jutting into the sky to Garv's right in the photo.